Paperramma designs innovative and personalized art to celebrate each of life’s special moments. From trendy and personalized Canvas Guest books for the bride & groom’s special day, to one-of-a-kind personalized nursery decor, and interactive map prints to mark the family travels. [thrive_accordion_group title=”Q & A with PaperRamma”][thrive_accordion title=”How does PaperRamma go Above and Beyond for Each Couple?” no=”1/2″ default=”no”] “We love our clients, and they love us. We have over 3,600 reviews to prove it. Our clients love our dedication to customer service above and beyond their expectations. This dedication comes from a list of core values that we all stand firmly behind including: Individuality, Personality, Transparency, and Respect. “We respect and understand individuality, it’s what our company is built upon. Everything we do is tailored to each individual. From personalizing to color matching, our products are fully customizable, offering flexibility and meeting the needs of our clients. “We like our clients to know that while we may be miles (or thousands of miles) apart, we are individuals, not robots or personalization machines behind our computer screens. We have been known to strike up conversations with our clients, offering advice to new brides, sharing the excitement of new mothers- meanwhile- offering feedback on their design every step of the way.” [/thrive_accordion][thrive_accordion title=”What Makes You Different Than the Rest?” no=”2/2″ default=”no”] “Each one of our wedding guest books tells an individual story. 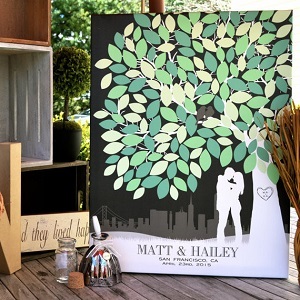 A modern spin on a traditional concept, our custom Guestbook Trees are a wedding guest book – in the form of a beautiful custom art print which hangs in in the Bride and Groom’s home. It is a memorable customized keepsake and beautiful reminder of the Bride and Groom’s special day long after that beautiful white dress is tucked away. “Our wedding guest books are truly unique. They can be personalized with the skyline where the bride and groom first fell in love, the one they now call home, or other location that has great meaning to them. From personal details like an “inside joke” “carved” into the tree, to including beloved furry and non-furry friends (yes, it’s true, we’ve even added a beloved pet fish, complete with fish bowl, on a bench near the tree). Our designers love how every guestbook is a unique representation of each couple, from colors to skyline, text, couple silhouette, “carving” in the tree, no two are ever the same.